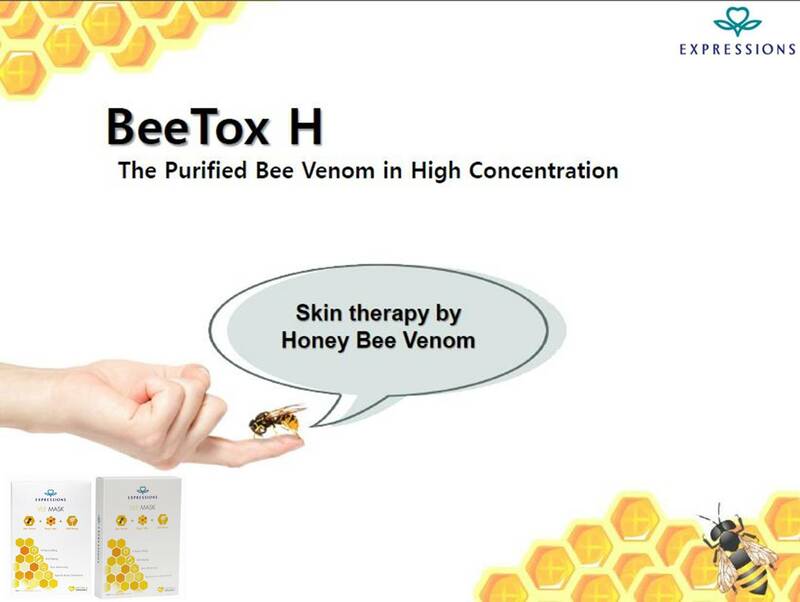 Expressions VEE facial mask, based on the sting of the honeybee, purified and used in high concentration will help with skin tightening, stimulate blood flow and collagen production. 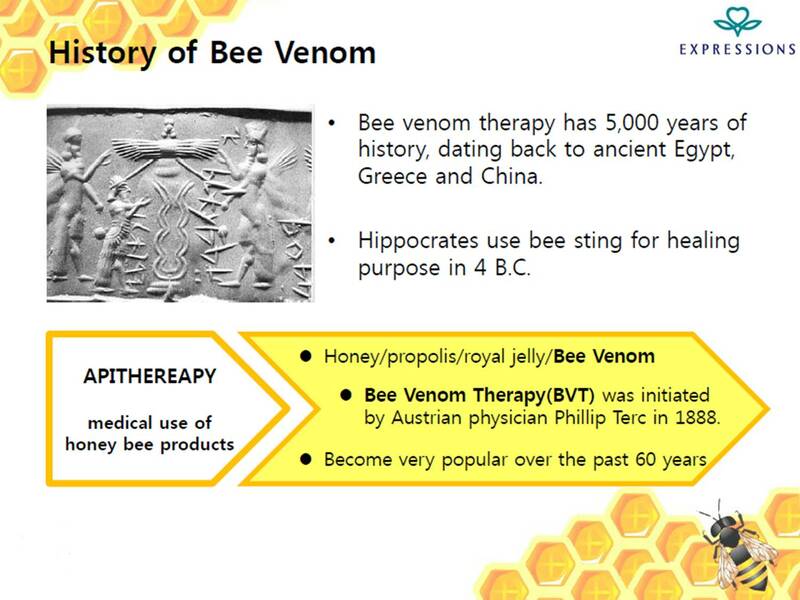 Honey bee venom has been famously known to be exported to Europe and used is many cosmetics products. Thanks to its high concentration of Melittin, a biologically active as a antiviral agent with anti-inflammatory and anti-bacterial effect, the Vee-Mask helps reducing acne and spots. Ingredients are tested and proven to help whitening, repair skin damage and lift V-shaped face. Achieving healthy and naturally beautiful looking supple skin. ~ In order for the essence concentrate to be absorbed, leave 15-20 minutes and gently massage the remaining essence into the skin. ~ Use 2-3 times a week to keep your skin looking lively and fresh. 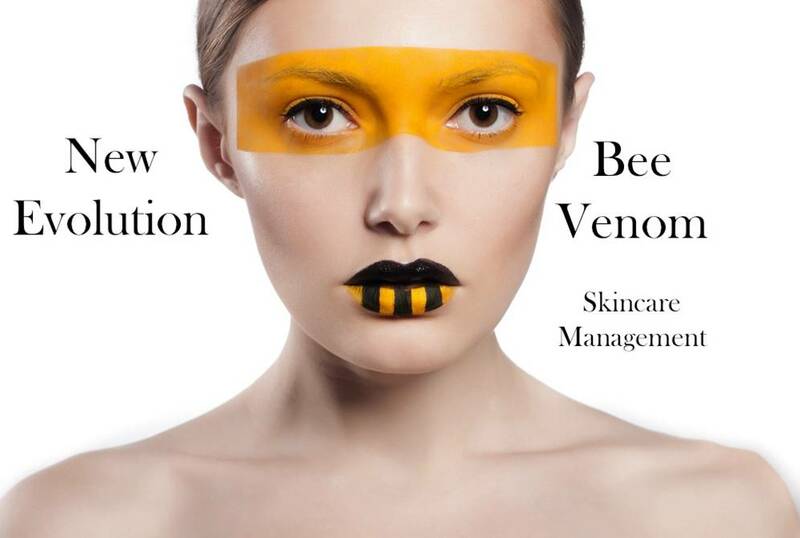 Expressions VEE facial mask, based on the sting of the honeybee, purified and used in high concentration will help with skin tightening, stimulate blood flow and collagen production. Together with the Bee’s natural activate ingredients such as royal jelly and wild honey that are tested and proven to aid cell renewal, whitening and repair skin damage. Achieving healthy and naturally beautiful looking supple skin. 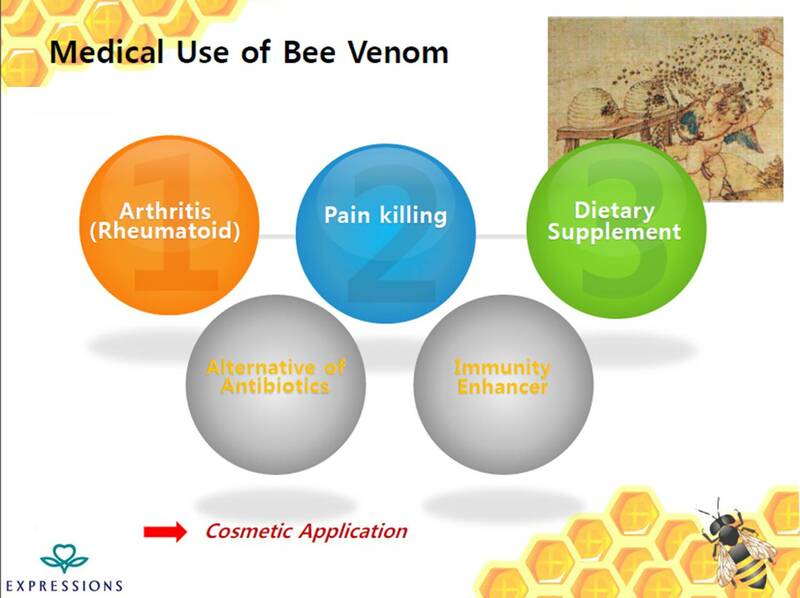 Honey bee venom has been famously known to be exported to Europe and used is many cosmetics products. It has a high concentration of Melittin, a biologically active as a antiviral agent with anti-inflammatory and anti-bacterial effect. 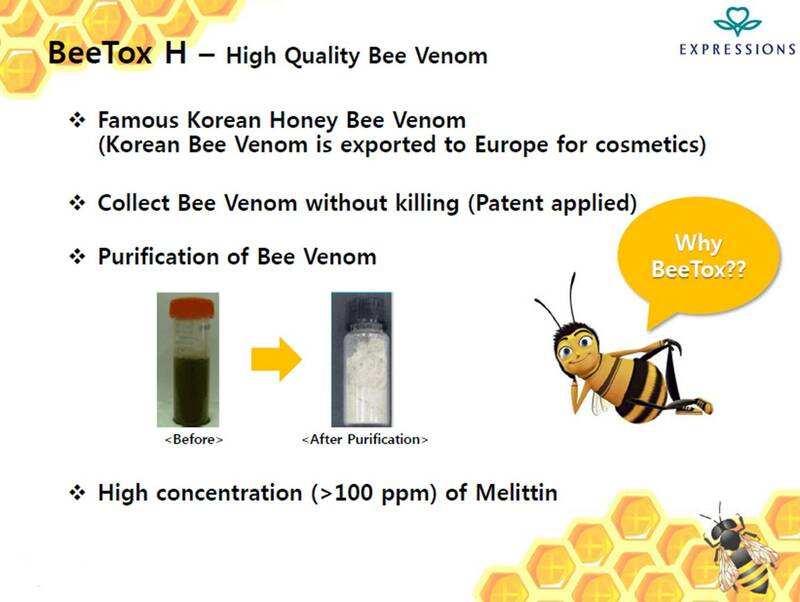 Expressions VEE facial mask is formulated from highly sought after bee venom, an ingredient used in many European cosmetic products. Upon purification and used in high concentration dosage it promotes skin tightening, stimulating blood flow and collagen production. The high concentration of Melittin, a biologically active antiviral agent with anti-inflammatory and anti-bacterial effect, Vee-Mask helps reduce acne and spots. With other natural ingredients such as royal jelly and wild honey that are clinically tested and proven to aid cell renewal, whitening and repair skin damage. 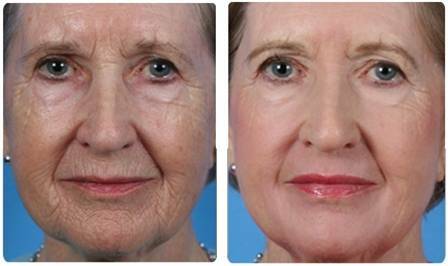 Our youthful formula and uniquely imprinted pattern transfuse nutrients and actives deep into the skin’s top layer where signs of aging occur. This targeted nutrient delivery system offers a prolonged release after removal of the mask, continuously powering fundamental active ingredients to the skin cells. The patented water-free delivery system will leave skin rehydrated, radiant, and petal-soft. This fashionable LED makeup mirror with 3x magnifying function which allows user to do makeup more easily, and its compact and portable design is convenient for user to carry. Strong but soft LED light: User can do makeup effortlessly even in the dark place. 3x magnifying mirror: checking your makeup without effort. And it is perfect for lining eyelids, applying mascara etc. Compact and portable size: allowing user to take along to check makeup anywhere anytime. 360 degrees rotation: allowing user to adjust the angle they want easily. Equipped with a stand: it can be severed as desktop mirror. Energy saving LED bulbs: the LED light works for 10 minutes a day, lifespan of the battery can be 100 days. Fashionable and classic design: round shaped with bright silver chrome-plated bracket.